Hi ho there trusty readers. Little G may not be a mover and a shaker just yet, but he is super advanced when it comes to eating. So, I thought I would share with you what has worked and hasn't worked for us in the baby food shrapnel department (keeping in mind, of course, that these are just my opinions so take 'em or leave 'em). And now we have replaced the mush with finger food sizes of everything listed before in the mush category and now at 8 months, 3 weeks the only mush he tolerates is his oatmeal, yogurt and applesauce. But I digress...because this wasn't supposed to be a post on how or what to feed your baby but rather on baby feeding shrapnel. So here we go. 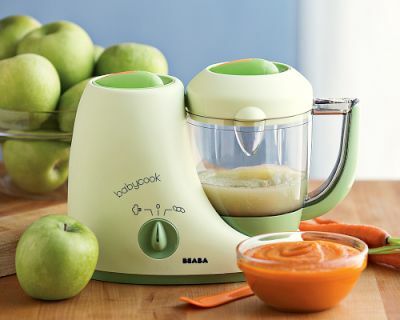 First up is the Beaba Cook Baby Food Maker available at Williams-Sonoma for $149 but I am sure you can find it elsewhere for a more competitive price. Alright...I am the first person to admit that I love me a kitchen gadget. I mean seriously...If I could live in Williams-Sonoma or Sur La Tab and have a puppy I would be the happiest lady on the planet. So when a friend of mine suggested that getting this was really a waste of time and money I was torn. But I listened to her and I am so glad I did. While I do not question the Beaba Cook being a great option and a wonderful tool...it truly makes no sense to spend $149 on a piece of kitchen equipment that doubles what you already have in your kitchen and will only be needed for 4 months anyway! If you want to steam some thing, use a steamer. If you need to puree it, use a blender, or food processor, or immersion blender...but don't go out and buy this because it won't even save you time. You see, with this machine, in between steaming and blending you still have to take the stuff out of the steamer basket and then put it back in the bowl which completely makes it exactly the same process as steaming it on the stove and then putting it in a bowl to process it. Seriously people, I KNOW we all love a cute counter appliance, but I just don't think it is worth the cost or the counter space especially when for all intents and purposes your kid will only eat mush for about two to four months. However, the next two products are also from Beaba and I HIGHLY recommend them, especially this first one!! HIGHLY HIGHLY HIGHLY!! 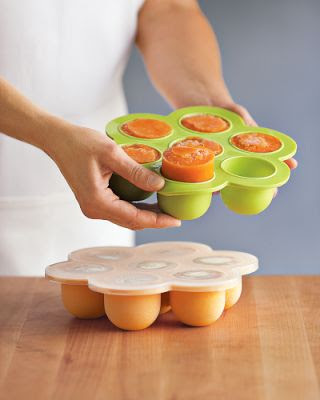 If you ARE making your own baby food, you will want to freeze it so that you can just pop one out of the freezer and thaw it and have yummy food for your baby. You can totally put it in ice cube trays if you want to, but these Beaba Multiportion Freezer Trays (also available from Williams-Sonoma) each hold 2 oz, are BPA free, and are flexible with a small indentation at the bottom of each cup making it super easy to release whatever you have frozen from tray (which is key and totally the feature that elevates this so far above the simple ice cube tray). We belong to a CSA and get most of our veggies from them so I had been storing up pureed veggies for Little G for a little short of a year. Once they were frozen, I popped them out and wrapped each one in saran and foil (which seems excessive, but it really prevents against freezer burn and if you are careful you can reuse them) and store them in the freezer for when we needed them. The other Beaba item are these awesome BPA free Soft Spoons, yet again available at Williams-Sonoma. We've been feeding Little G since well before he had teeth and these are super soft on his gums. Even now, he has two bottom teeth which make these great because they don't scrape. And my husband and I love that the handles are long and adult sized so we can stir up a yogurt and not have to deal with the entire spoon being dunked. Also, Little G loves to try and feed himself and that usually ends up with him chewing on the wrong end of the spoon which makes me super happy that these aren't part metal. They're dishwasher safe too which is always a plus. Stepping away from the Beaba line, we move towards the Boon brand. 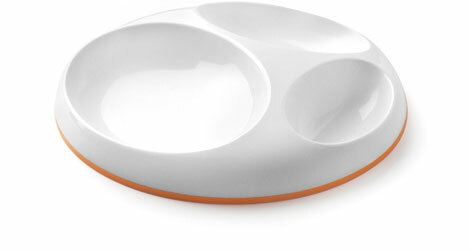 Right now, we are loving our Boon Saucer. It has an edgeless design with a rubber rim that makes it reallllly difficult for Little G to just grab it and dump everything off of it...that doesn't mean he doesn't achieve that goal every once in a while...but it does thwart his efforts enough to help him focus on the food on his plate rather than trying to use the plate for evil. We also really like the divided sections, but not because we care if his food is separated, but rather because it gives Little G some nooks and crannies to use to get his food in his hand since his pincer grasp is still on the inferior side. 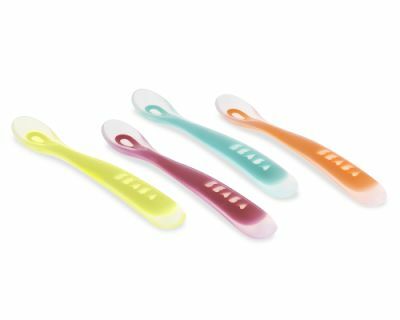 Also from Boon is this super cute, very convenient baby food dispensing spoon called Squirt. It is expensive for a spoon, but awesome for on-the-go feeding. With one of these, I am able to bring along a baby-sized container of yogurt and not have to deal with the mess of what to do with the empty container and sloppy spoon when I am done. However, I can't completely recommend this product because I do have a couple of issues with it. First, it only comes with one cap...and if you can find me someone who has never lost a cap to a pen, than this is perfect for them, but we lost our cap in the dishwasher before we ever used the spoon and in order to get a new cap, we had to shell out the bucks for another spoon...which my husband did since I had told him not to put the cap in the dishwasher to begin with, but I digress. My other issue is that you can't really use this for anything other than perfectly pureed food which seriously means you'll get about a month's use out of it for anything other than yogurt and for that you might as well schlep around a plastic baggy to keep your sloppy spoon in and save yourself the cash. 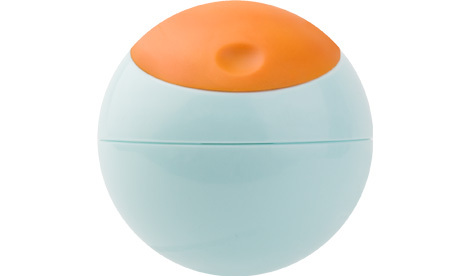 Lastly, also from Boon, is this super-cute Snack Container. I will admit, I put this on my registry because it looked cool, not because I had read any reviews on it. On the one hand, I totally love the design of it...on the other hand, Little G can't just hold onto it and feed himself (yet, I am sure that day is coming). But it doesn't even have a flat end to it so if you get some puffs out and then need to set it down on the table it just rolls away. Also, there isn't any way to attach it to a stroller or high chair so that you don't have to worry about your kid throwing it away from them and you having to retrieve it because it is essentially a ball. Of course, the upside to that is I have forgotten to pack a toy in the diaper bag multiple times and yet been able to use this for some entertainment...so make of it what you will. I have a couple of other products related to feeding Little G that I will save for another post (namely his bottles and the awesome system we use for doling out his formula and being able to have snacks for mommy too). But for the most part, these are the things we use (or in the case of the Baby Cook, DON'T use) to keep our kid fed and satisfied. Feel free to ask any questions you might have on the various products listed here. We have (had, I can't remember where I put it) the boon spoon, good to know the pluses and minuses! Thanks for the great post, I had been thinking of getting the Beaba freezer tray without getting the babycook, and I see it was a good idea! Thanks a ton! Thanks for the tips! I also want to say I really love your blog, these types of posts as well as your posts on motherhood musings. If I didn't have an infant to take care of I would comment on every single post! Thanks so much for all of the insight. Ivy - Garrison HATES anything with a texture, but will totally pop 'gummy' type things in his mouth. Example...he LOVED perfectly pureed avocado, but when I tried to just mash it up, he hated it. However, if I cut it into cubes, he mashes it himself in his mouth. Cottage cheese, he literally turns red, sticks his entire hand in his mouth and gags himself. Not because he doesn't like the taste, but solely based on the texture! Next time you have something with a bone for dinner, like pork chops or steak or whatever, give the bone with a little bit of meat on it to Eva to just hold...she might surprise you. Good to know! I've often wondered if it was worth getting. Now I'm sold. I am definitely going to make my own baby food.